While it appears that blogging is alive and well, some are of the opinion that feeds and feed readers are dying. And lately I do find that I spend increasing amounts of time consuming tweet streams on my iPhone which means less time in my trusty Google Reader. But when I do find some time to spend in Reader, the quality, depth and speed of my information consumption is so far superior to anything else I know of on the net. The main challenges with Reader are knowing what feeds to subscribe to (and unsubscribe from) and constantly re-sorting so that you can easily read your favorite feeds first. (The same thing can be said of Twitter to a large degree, minus the sorting). Love him or hate him, Michael Arrington’s TechCrunch is arguably a premier news source and usually one of my daily favorites. But it’s a medium- to high-volume blog and recently I’ve found I simply couldn’t keep up with it. I generally enjoy posts written by Arrington as well as most of co-editor Erick Schonfeld’s. I also like about half of the rest of the staff writers there and sometimes the guest posts are worth checking out. Their blog does provide individual feeds for each of the writers but that approach would get me too many feeds and I’d miss out on any new staff and guest writers. 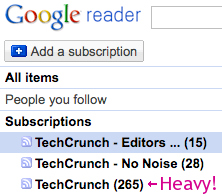 With Pipes, I created two filtered versions of TechCrunch: Editors Only and No Noise. The Editors Only feed (pictured above) contains only posts by Arrington and Schonfeld. The No Noise feed filters out some of the writers that I find report on more mundane stories (it also filters out the two editors so I don’t have dupes). The reason I created two separate feeds is to provide more granularity for my feed reading priority list. 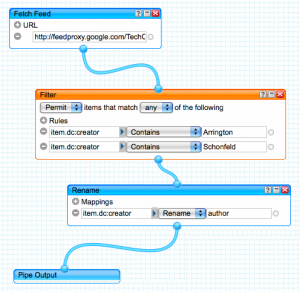 One annoying bug that I discovered on my first attempt at these pipes was that the post author’s name wasn’t showing up in Google Reader. 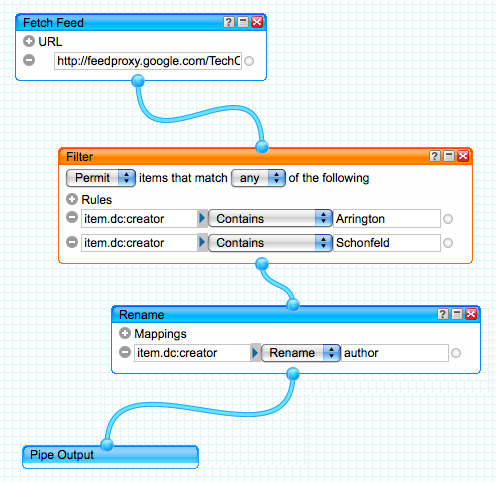 Luckily I worked out a fix for that: add a rename mapping for “item.dc:creator” to “author”. Another minor annoyance with Pipes is that they don’t seem to refresh nearly as often as the original source feeds (e.g., expect up to an hour delay). But that I can live with as I simply don’t have the time to refresh my feeds all day waiting for something new to pop up. With my two new “piped out” feeds I’m now able to keep up with TechCrunch without spending nearly as much time tapping the j-key in Reader.